A parcel tax to pay for complete salary restoration for all Denair Unified School District employees will not be on the November ballot. The earliest community members could vote on the idea would be next March, school trustees were told Thursday night. A parcel tax would add less than $100 per year to each property owner’s tax bill. The concept has been floated as a way to restore pay for teachers, classified employees and administrators, all of whom took steep pay cuts in 2013 when the district teetered on the edge of state takeover. Though the district’s finances have since stabilized and overall enrollment – especially at the elementary level – has shown growth, longtime employees still are paid today about what they were 11 years ago. Trustees steadfastly have pledged to close that gap, but only when assured that higher wages could be sustained without impacting the budget. Thursday, the board gave the go-ahead for new Superintendent Terry Metzger and Chief Business Officer Linda Covello to continue investigating how to bring a parcel tax to a special election as soon as March. To pass, it would need two-thirds approval from voters. A public hearing to flesh out more details and solicit community reaction is likely to take place at the board’s next meeting Sept. 13. A special election could cost the district as much as $50,000. The parcel tax might only be in place for three or four years, trustees were told. All the money would be used to restore salaries, which has been a major issue not just for employees but for community members concerned about turnover among teachers. “The parcel tax contributes to education in Denair because it allows us to restore salaries, hire and retain staff, and advance the quality of education,” Metzger explained. Coupled with a discussion about a potential parcel tax was a presentation by Metzger and Covello about transforming DUSD into a charter district, which would allow greater flexibility in programming and teacher assignments. Denair Elementary Charter Academy and Denair Charter Academy (for home-school and independent study students) already operate in such a manner. 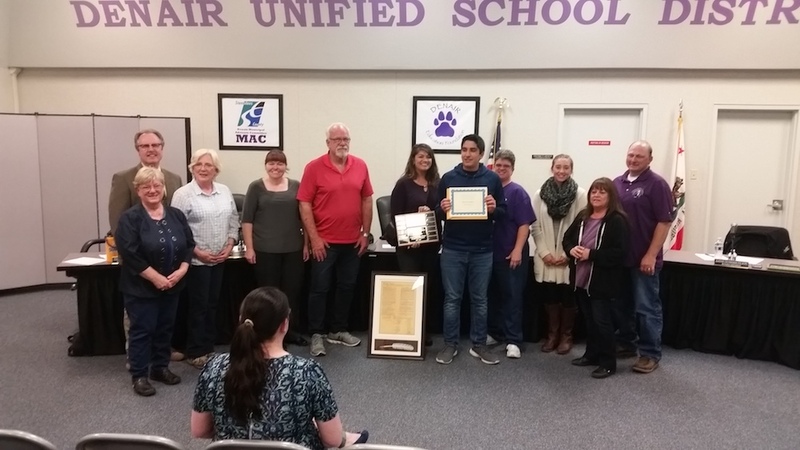 A new charter would extend to Denair Middle School and Denair High School. Key to the charter concept, the leaders explained, is the creation of fully integrated “pathways” that begin in kindergarten and extend through high school. Parents and students could choose from career and technical education pathways that include not only core academics but music, Spanish and world languages, young farmers, special education and possibly law enforcement. Exposure to STEAM (Science, Technology, Engineering, Arts, and Math) concepts would be emphasized in each pathway, as would leadership activities. The idea is to prepare students not just for college, but to move from school into productive careers. At least half of Denair’s teachers must sign off on the charter idea, but Metzger said “we want a bigger consensus than that.” Community input must be solicited and a committee formed to write the new charter, which ultimately needs approval from the state Board of Education. Like the parcel tax, that also could come early next year. There is much to do before either vision can be implemented, though. “We need to make sure this is the right decision for Denair Unified,” Metzger said. Heard a presentation from the district’s bond agent that shows the decision in June to refinance long-term construction bonds sold in 2007 will save taxpayers an estimated $895,000 over the next 14 years. In addition, a separate refinancing of certificates of deposit issued in 2004 to build the middle school will save another $452,000 over 24 years. Listened as each campus principal reported on the first day of class, which began Wednesday. DECA Principal Kelly Beard said three grades are completely full, with waiting lists for two of them. High school Principal Kara Backman said there were 30 more students on campus than on the first day of school last year. Swore in Logan Pierce and Scott Badal as this year’s student board members. Watched a 15-minute documentary profiling three Denair students. The video, called “Unified,” already has been viewed more than 19,000 times since it was released Aug. 2. Terry Metzger has been superintendent of the Denair Unified School District since July 1, but Monday was her first chance to introduce herself to most of her non-administrative staff. Those who haven’t met her before were treated to a fun, inspiring and illuminating presentation about their new boss. For instance, while sitting in the Coyote Center, they watched as Metzger narrated a series of coyote photos – a pup (acknowledgement that she’s the newest employee), a playful young coyote (she likes to laugh and encourages professional humor to relieve stress), a serious adult coyote (to underscore her long-term commitment to the district) and cartoon character Wile E. Coyote (she described her “hidden agenda” as providing every student with the best possible education, including a willingness to employ “rockets, anvils, and dynamite” to get kids to learn). 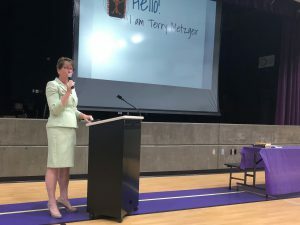 Metzger also offered personal anecdotes about her family and career, which brought her to Denair from the Rincon Valley Union School District in Santa Rosa, where she was assistant superintendent for curriculum and instruction since 2012. One of them, Metzger said, was not to give up on your dreams even in the face of such a serious situation. “The first thing I asked the orthopedic surgeon was, ‘I have an overseas trip planned in nine weeks. Do you think I’ll be able to go?’ ” Metzger recalled. “He told me he doubted it; a stand he took until about two weeks before my trip when he said it would be difficult but possible. The day after they returned from Europe, Metzger and her family faced another harrowing situation. Sonoma County was on fire. Twice, they had to evacuate their home in Santa Rosa, each time not knowing if their neighborhood would be standing when they were allowed back in. She showed Denair employees a photo of the Tubbs Fire, in which 24 people died and nearly 5,000 homes were destroyed last fall. Metzger’s home in eastern Santa Rosa was saved, but she knew many people who lost everything. She said the experience taught her the value of community, about friends and neighbors being there for each other in the worst circumstances many will ever face. She said that community spirit – which she already has seen in Denair – is an important component of quality schools. Metzger also shared some of her learning philosophies, gleaned from more than 30 years as a teacher and administrator. She talked about the ways students learn in and out of the classroom, and encouraged her staff to strive for “cognitive conflict,” which she defines as a collegial culture that promotes professional growth. DECA: 8 a.m. to 2:40 p.m.
DMS: 8 a.m. to 2:45 p.m.
DHS: 8 a.m. to 2:45 p.m.
An account technician, the longtime director of technology, two popular maintenance workers and a special education assistant and have announced their retirements from the Denair Unified School District at the end of this school year. Combined, they have 128 years of service in schools. 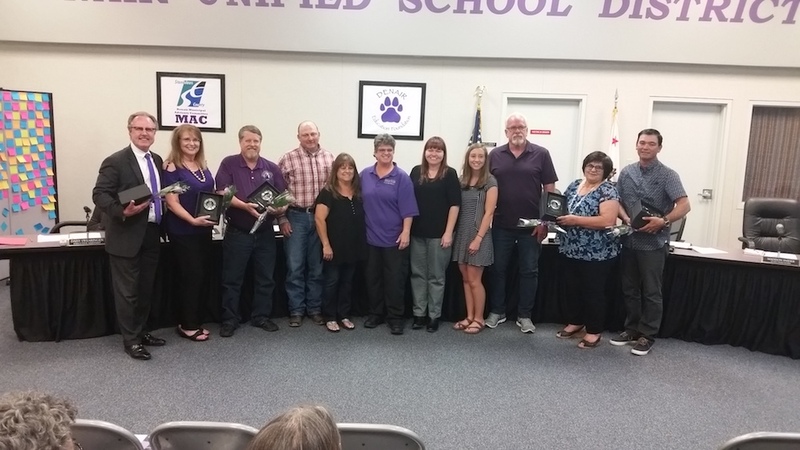 The five retirees were honored with gifts and testimonials May 10 at an emotional Board of Trustees meeting. There were smiles, hugs and more than a few tears – of gratitude and happy memories, and from close friends who won’t be seen quite as frequently. Also acknowledged and congratulated on a job well done was Superintendent Aaron Rosander, who is leaving after 4½ years and moving to the Bay Area to be closer to his elderly parents. Rush said it “has been a pleasure working” in the business office for more than three decades, but that she’s excited about the chance to spend more time with her family. “My plans are to do what I want when I want, to help with my six grandchildren when I’m needed and to wait for my husband to retire so we can travel throughout the United States,” she said. Among her favorite memories are the morning pots of coffee brewed by Ranes in the district office. “He used to make the best coffee,” Rush recalled. “The other wonderful experience was meeting and becoming friends for life with other parents by being involved with Sports Boosters and Sober Grad,” she said. Mark Ranes, 34 years in the district: Ranes spent the first 13 years of his Denair career teaching science to sixth-, seventh- and eighth-graders at Denair Middle School. But in the mid-1990s – when school districts could barely imagine the impact computers someday would have on education – he left the classroom to become the district’s first and only technology director. “The biggest accomplishment early on in the technology area was being the first district in Stanislaus County that had a networked computer in every classroom. In 1996-97, that was unheard of,” Ranes said. “But overall, I think the biggest accomplishment of all is maintaining 20+ years of technology use in DUSD, where we stayed focused on the people using the technology, not the technology itself. His responsibilities brought Ranes in contact with every district department, so it’s no surprise when he admits that his biggest adjustment will be making up for that daily interaction. Until his wife, Brenda – a teacher at Denair Elementary Charter Academy– retires and they can do more traveling, Ranes expects to spend much time on his twin passions – home brewing and baking. 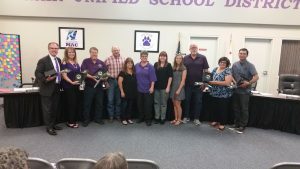 Even as the search for a new superintendent enters its final stage, the current leader of the Denair Unified School District reminded the community Thursday night not to become complacent about the financial progress that has been made in the past four years. Aaron Rosander, the man hired in 2014 to engineer the district’s turnaround from the brink of fiscal crisis, will retire at the end of this year. His replacement has been chosen, though he or she is not expected to be publicly introduced until the May 10 Board of Trustees meeting. The new superintendent will inherit a district that has made significant progress to earn back public trust by restoring financial stability and improving classroom results. But crucial work remains, according to Rosander. Enrollment at the high school and middle school must begin to grow again, innovative new educational programs must be introduced and employee salaries must be fully restored after deep cuts enacted in 2013. The key, he believes, is a two-pronged strategy unveiled two months ago: creation of a new charter concept to cover “seamless academic progression” from kindergarten through high school coupled with voter approval of a small parcel tax to provide necessary revenue. The Denair Unified School District board narrowed the list of applicants to become the next superintendent to four finalists at a special meeting Monday night. Trustees also announced the names of nine employees and community members who will participate in two days of interviews this weekend that will lead to the selection of the next superintendent. The board’s search for a replacement for Aaron Rosander has been guided by consultants from McPherson & Jacobson, who helped trustees winnow a list of 21 applicants to the final four. Rosander announced in February he will leave the district at the end of June after 4½ years. Chief Business Officer Linda Covello, the district’s lead official for the search, said applications were received from educators in Stanislaus County, other parts of California and outside the state. Two finalists will interview with trustees as well as the stakeholder committee on Saturday and two more will do the same on Sunday. The meetings are not open to the public. 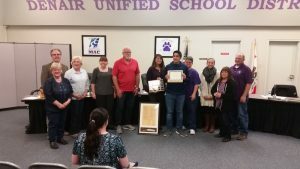 The members of the stakeholder committee are student Adrianna Snyder, community member Dennis Findley, classified employee Gayle Schell, teacher Deborah Voss, Senior Director David Naranjo, Denair High Principal Kara Backman, and parents Gerardo Retana, John Greff, Cheryl Rice and Leticia Christen. The committee will provide input and insight about the finalists to trustees, who expect to decide on a new superintendent Sunday night. Once that choice is made, McPherson & Jacobson will conduct a final round of background checks before an offer is extended. That person is expected to be introduced at the May 10 board meeting, with the new superintendent in place by July 1.